IBC don’t list “90” sources, they list nearly 200. IBC don’t “emphasize” the full list above any particular subset. (They simply provide a full list and analyses of percentage coverage of subsets). The fact that a given subset of 20 (or 10, 12, 30, 5 – pick a number) media sources picks up a large number of incidents/deaths, proportionally, has little to do with IBC, whose database simply reflects this real-world fact. Walter refers to the 90/20 thing about a dozen times, apparently without realising that it’s his own construct (possibly based on a mistaken interpretation of a statistical breakdown posted by Gunnar: “90% of citations come from 21 sources”), and with about as much bearing on IBC as the Daily Mail on immigration. Of course, it’s not a question of IBC’s “usual” (or “typical”) “20 sources” (as Walter incorrectly puts it), but of an unequal distribution of media coverage in the real world, which means that there will be a “top 20” (or 10 or 5 or whatever) sources in terms of proportional coverage of incidents/deaths. For example, Al Sharqiyah TV is in IBC’s top 10 sources much of the time, because it picks up a large percentage of total incidents/deaths relative to other sources. Walter misconstrues the issue in terms of “whether twenty sources is as good as ninety”, as if IBC “usually” (or “typically”) restricts itself to monitoring only 20 sources (which doesn’t follow at all from the above statistical beakdown). Walter claims that “IBC give a misleading account of their comprehensive range of sources”. I asked him to point me to this alleged “misleading account”, but he hasn’t responded to this request. He also writes: “Given the 20 sources issue, IBC’s ‘comprehensive’ seems an exaggeration”. This shows remarkable confusion on Walter’s part. IBC’s compilation of corroborated reported deaths is “comprehensive” to the extent that it misses none – not to the extent that it contains an artificial, unrepresentative (and impossible) flat distribution of all sources. In the absence of any evidence (over a period of more than six years) that IBC is missing a significant number of reported deaths, it would be pointlessly silly to attack the claim that it’s a “comprehensive” database of reported deaths. Gunnar frames his criticisms of IBC in the same confused way as Walter, but to make matters worse he adds the following ignorant fallacy: “IBC gives a long list of media the[y] apparently cover, when it comes down to it they actually only quote a few different sources in their database”. I asked Gunnar to go away and count the number of sources cited in IBC’s database. He hasn’t replied yet. Perhaps he’s found more than “a few”? (Hint: IBC’s long list is titled ‘Sources used by Iraq Body Count’ [my emphasis], every source listed is assigned an abbreviation for database citation, and they all seem to make an appearance in the form of db citations). I’ve attempted to patiently explain some of this stuff to Gunnar on previous occasions, but it doesn’t seem to register, so I end up repeating myself every few years. I do think that what occurred here is in the spirit of the Stalinist Gulag, or perhaps the Maoist criticism-self-criticism session, though on a vastly different scale, since, thankfully, the folks here are powerless. With one exception, there was no attempt at any real dialog, there was simply a process of finding grounds to dismiss me, combined with a constant hectoring because I didn’t phrase things the way that is to be officially tolerated. But it was the lynch mob psychology that was the most disturbing, and the fact that no one said “STOP!” The message implicitly was being sent to anyone who might publicly deviate from the group consensus that this is what will happen to you should you deviate. I used to think that we needed a group like Media Lens in the US. Now I am simply thankful that this particular flavor of Stalinism hasn’t yet emigrated. The society you fight for would end up, despite the nice words, as being one of the jackboot stomping on the human face forever. I myself have long given up expecting to enjoy the freedom to participate in open and fair debate here. The last straw came when one of my posts vanished without trace. 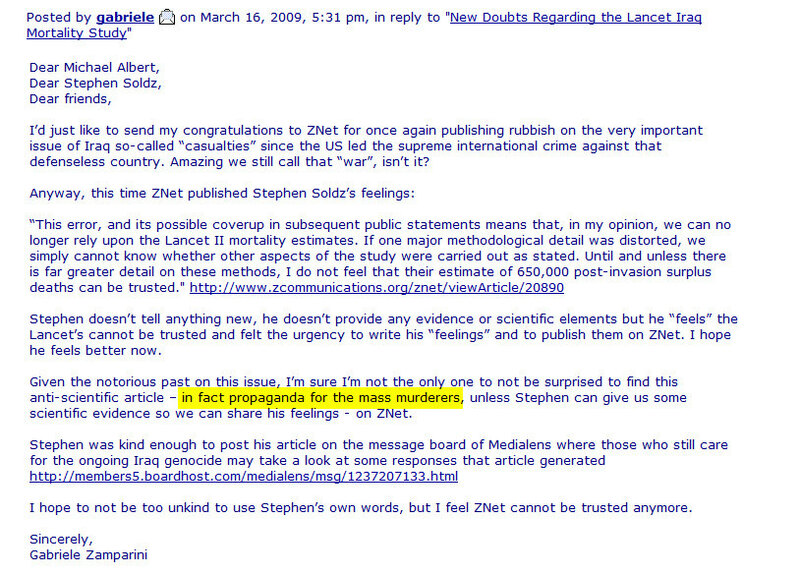 When I enquired, the [Medialens] Editors admitted they had deleted it. Their excuse that “it didn’t add anything to the debate” struck me as disingenuous. Plainly they were preserving the precious feelings of one of their favoured sons. They could not cite any board rules which it had violated. 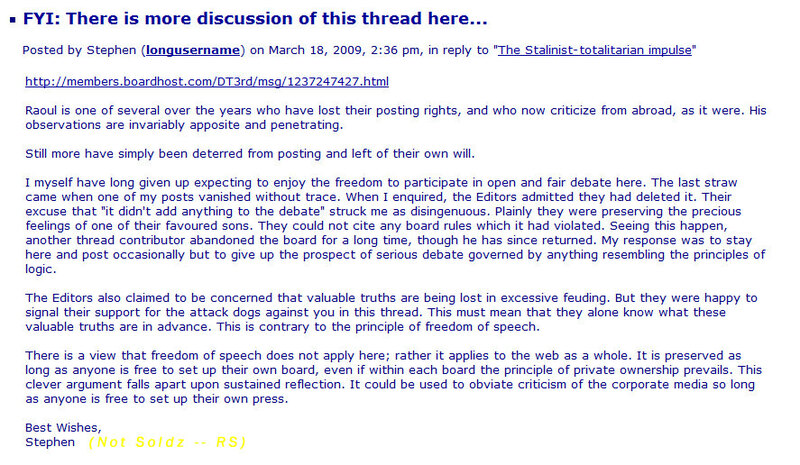 Seeing this happen, another thread contributor abandoned the board for a long time, though he has since returned. My response was to stay here and post occasionally but to give up the prospect of serious debate governed by anything resembling the principles of logic. The Editors also claimed to be concerned that valuable truths are being lost in excessive feuding. 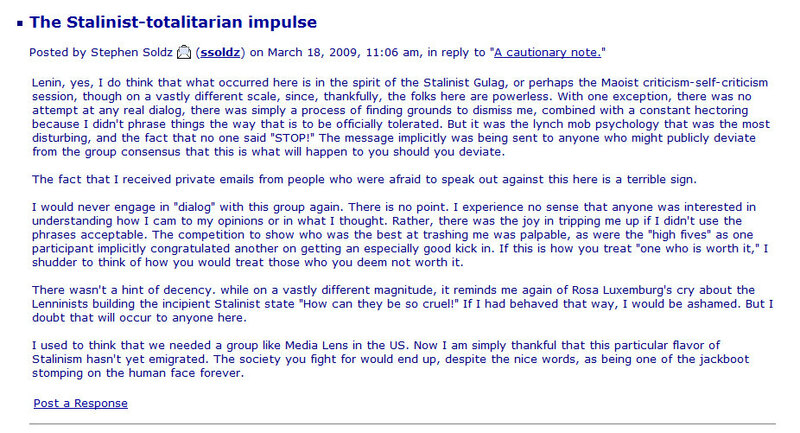 But they were happy to signal their support for the attack dogs against you [Soldz] in this thread. This must mean that they alone know what these valuable truths are in advance. This is contrary to the principle of freedom of speech. 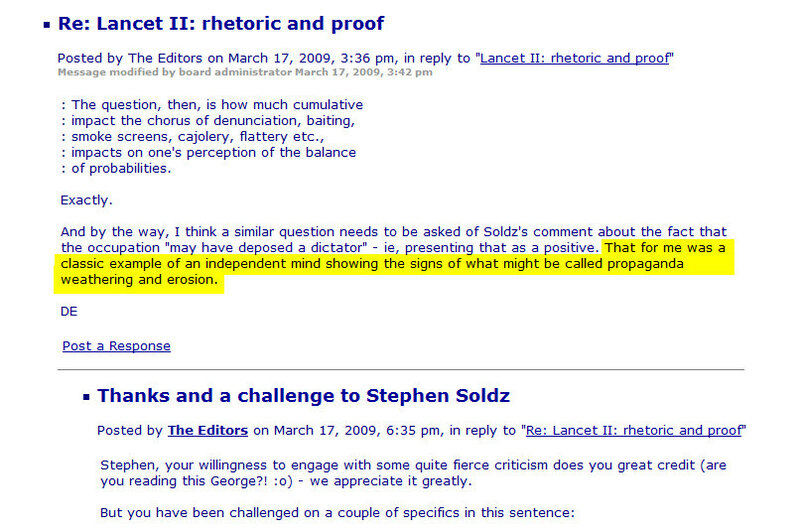 *Stephen Soldz’s piece on the Lancet 2006 study is available at Znet.